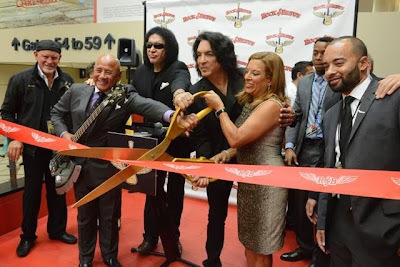 Rock & Brews had its official grand opening today in Terminal 5 with co-founders Gene Simmons and Paul Stanley of the band KISS, where guitars and rock music were part of the celebration! The first-ever Rock & Brews Concert Bar And Grill at any airport features dine-in or "Grab & Go" American cuisine plus 24 beers on tap! Stop by the rock-themed Rock and Brews for great eats and drinks. Rock on!